Muriel Bodley instructs stu­dents at Immaculate Conception School in the Suzuki Method through a pilot program to teach the children how to play the violin. 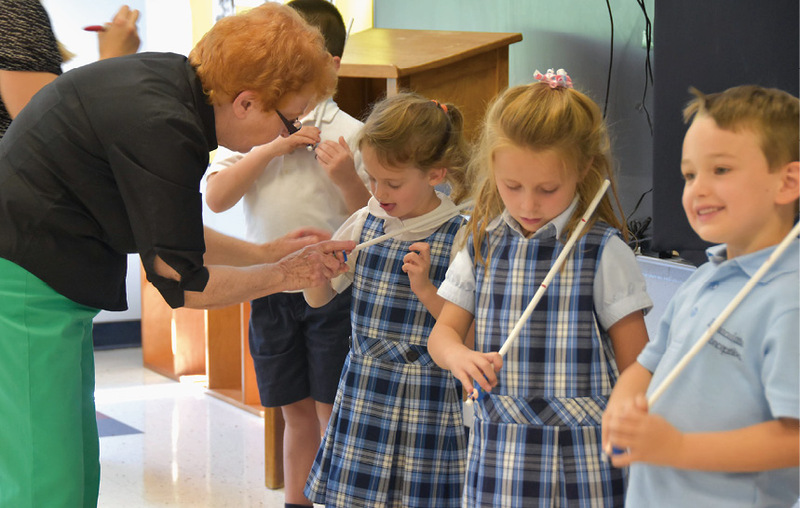 Kindergarten and Pre-K students at Imma­culate Conception School in Fayetteville are learning how to play the violin through an exciting new pilot program, the Suzuki method. The Suzuki method was developed by Japanese violinist Shinichi Suzuki when he taught Japanese children in the 1930s. He believed the emphasis should be on the development of the whole child in a nurturing environment, an education to bring out the human potential of the child. The Suzuki pilot started at IC in the fall of 2016 with accomplished music teachers Alyssa Blount and Muriel Bod­ley at the helm. Both women have been trained in the Suzuki method. Blount received her training at the Ithaca College Suzuki Institute. Over the last 10 years she has taught at Syracuse University as well as in the Fayetteville Manlius and Liverpool school districts. In addition, she has taught at her home music studio. Bodley, after retiring from the Fayetteville school district, initiated an orchestra program at an area Catholic high school. She serves on the performing arts faculty of Le Moyne College, and she also taught at Syracuse University. Bodley received her Suzuki training from Ithaca College, University of Wisconsin at Stevens Point, Manhattan School of Music and Syracuse University. She also served as co-owner and director of Suzuki School of Syracuse for 20 years. Parental involvement is a very important principle of the Suzuki method, and the rela­tionship between parent, teacher and student as they work together is key to bringing about the growth of not only a musician, but a beautiful human being. Sally Lisi, principal at Immaculate Conception, is pleased to offer the new program. “It’s exciting,” Lisi said. She believes wholeheartedly in the principles of the Suzuki method. Blount and Bodley teach classes of two to five students in half hour periods. They are taught the proper foot placement, which arm is used to raise the bow, correct placement of the bow, breathing technique and proper finger placement.